Investment on social media marketing is one of the prime objectives in any business strategy, as outcome is huge compared to money invested. This is resulting in more number of jobs for social media marketers and firms have started considering to maintain in-house social media marketing team to acquire new customers through engagements on Facebook, Twitter, LinkedIn and Google+. 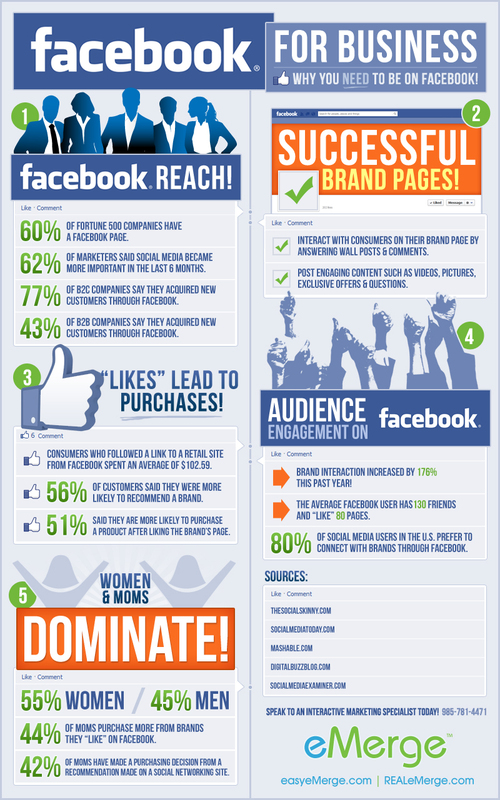 The infographic from Visual.ly highlights few interesting takeaways and statistics justifying brands presence and need on Facebook Inc. (NASDAQ:FB). Nearly 60% of Fortune 500 companies have a Facebook page. About 62% of marketers said social media became more important to them in last 6 months. 77% of B2C and 43% of B2B firms have acquired new customers through Facebook. It is important for brands to have presence on Facebook as brand interaction has increased by nearly 176% in last 1 year. On an average a Facebook user likes 80 pages and has 130 friends. In U.S, 80% of social media users prefer to connect brands through Facebook. Consumers who follow retail sites on Facebook spend on an average $102.59. ‘’Facebook likes’’ generally lead to purchases. Close to 51% of customers said they are likely to buy a product after liking a brand’s page. Post acquisition of a fan adding Images, Videos and Offers are the main aspects that drive engagement for brand pages. Women are more Facebook friendly when it comes to conversion of fan into customer. In last 3 years, exploding increment was observed in demand for social media professionals in various firms across the world. Facebook has been major center of attraction for marketers because of its 1.15 billion user base compared to other social networks maintaining far lesser number of users. Engaging customers on Facebook through various strategies like coupons, discount vouchers and entertaining content are best way to drive traffic to your website.